Stunning ceilings add character to diverse spaces throughout Sea Island. 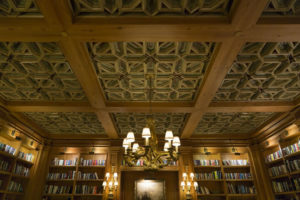 Ceilings have long served as defining features of iconic rooms and buildings; consider the Sistine Chapel in Vatican City, or Grand Central Terminal in New York City. Many of their smaller details may not be easily visible—you can’t see Michelangelo’s individual brush strokes in the chapel’s elaborate paintings, for example—but they still have an undeniable impact on the overall space. Due to their skyward location, ceiling designs often go unnoticed, at least at first. Yet even if you don’t consciously recognize it, a beautiful ceiling induces a feeling of cohesion when you walk into a room. It’s like the lining of a fine suit or the engraving on a ring. It’s a little surprise, an added touch of elegance and a sign of a distinct personality. 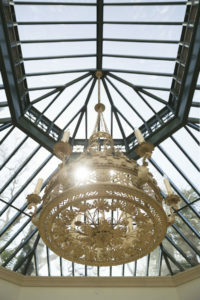 At Sea Island, the architecture and decorative details embrace history. “One of the things we wanted when people walk into any of these rooms is [for them to] go, ‘Wow—this isn’t done anymore. This is special. This could have been done two centuries ago,’ ” says Bill Jones III, former Sea Island CEO and a grandson of one of the resort’s founders. As you step into the following spaces around the resort, don’t forget to look up. Mizner was one of the most renowned American architects in the 1920s. His work was often inspired by his travels, and he is known for Spanish colonial and Mediterranean revival styles—all done without the benefit of formal university training. Mizner worked on a number of resorts and villas in Florida. The society architect was fond of eclectic and varied styles that were new in America at the time. Many of his buildings are now on the National Register of Historic Places. The Wine Cellar ceiling boasts Old World charm. Generally, a cellar or basement isn’t a place where you might expect to find a beautiful ceiling with a backstory to its design, but that’s what you get in the wine cellar at The Cloister. The rustic heart pine beams were cut on a 19th-century South Carolina sawmill, and the simplicity and styling echoes the spirit of Mizner. 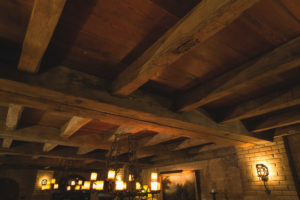 Next to the English and French ironwork and north Georgia limestone, the wooden ceiling helps give the room its intimate, Old World atmosphere, and reinforces the feeling of comfort and class. While some ceilings might take time to catch your attention, it’s likely that your gaze will instantly be drawn skyward upon stepping into the Clubroom. The sparkling crystal chandeliers (including one that has a revolving disco ball hidden within) and ornately carved ceiling panels and moldings are sure to impress. Jones describes the inspiration of the Clubroom as “more like a ballroom in an old-line city. A country club where people do debuts; a fancy party kind of room.” It hits that mark in a big way—the definition of grand, yet tasteful elegance, and a popular spot for weddings and receptions. 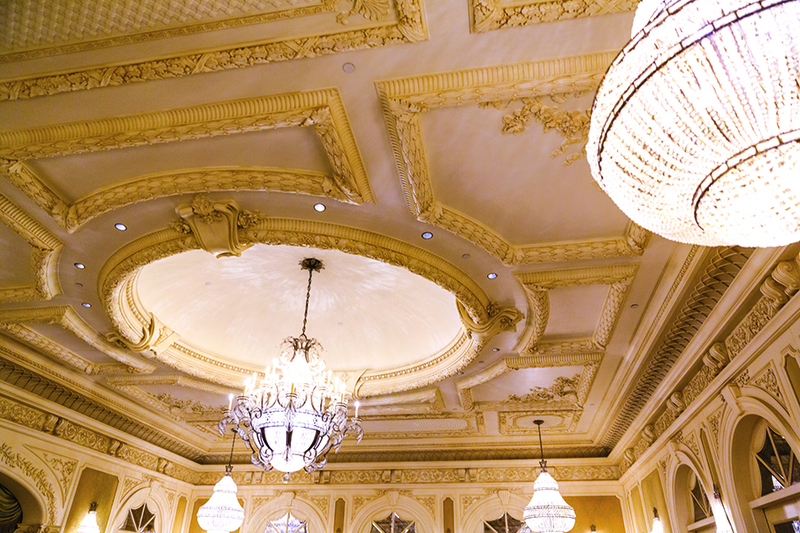 perfectly complementing the chandeliers, archways and hand-painted china. The coffered ceiling design brings structure and balance to the room. The heart pine beams in the library evoke the English countryside. to the stately feel of the intimate library located in The Cloister, offering a textural counterpoint to the book-lined shelves. The room, thanks in large part to the ceiling, has a continental look to it. The heart pine beams running along its top are reminiscent of an English country house. One of the greatest appeals of Sea Island is the natural world around it, which is filled with moss-draped oaks, stretches of beach and stately palm trees. The Solarium inside The Cloister takes full advantage of the picturesque surroundings. Thanks to its soaring glass ceiling, the room is flooded with light, lending the space and airy and casually sophisticated feeling. The ceiling makes the room what it is—an inspiring and relaxing spot, ideal for coffee in the mornings and lemonade in the afternoons. In the Oak Room at The Lodge, your eyes might first be drawn to the fireplace or the panoramic views from the windows. Take a moment to look at the seemingly unassuming ceiling, though, and you might find a surprise: it’s leather. The material is more than just an interesting and unexpected touch of texture and class. It helps absorb sound, and it emphasizes the room’s feeling of rustic refinement. The leather is a bit like the orange peel garnish on the Smoked Sazerac, one of the Oak Room’s specialty cocktails—you may not need it, but the overall experience just wouldn’t be the same without it. The River Bar at The Cloister, several of the cottages and Broadfield, A Sea Island Sporting Club and Lodge, all feature pecky cypress ceilings. Pecky cypress has a unique texture with irregularly shaped holes along its length. The holes are made through a natural process involving the growth of a fungus (which dies when the tree is cut down) inside the wood. The fungus only appears in cypress trees that are over 125 years old, and only in the heartwood, so it’s difficult to determine if the cypress tree will have the iconic pecky holes until it’s cut down. The rare wood makes for a unique finish, and is often used in décor or paneling. The pecky cypress in ceilings around the resort is, as former Sea Island CEO Bill Jones III explains it, “a nod to [Addison] Mizner.” The use of the wood was one of the famed architect’s trademarks.